School on track to have the highest enrollment in the nation. Carr Memorial Adventist Primary School in Port Moresby, Papua New Guinea (PNG) had big reasons to celebrate as parents, teachers, church administrators and the community witnessed its highest ever number of 195 students graduating from 8th grade. 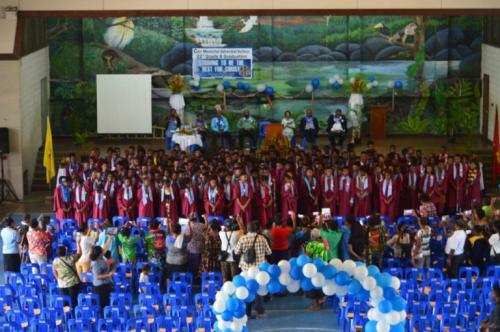 With the theme ‘Striving to be the best for Christ,’ graduating class members were fittingly adorned with new school gowns and the keynote address delivered by the PNG ambassador to the Asia-Pacific Economic Cooperation (APEC) Ivan Pomaleu. Pomaleu, whose younger daughter Luna was among the graduates as well, is an elder at the local Waigani congregation and the younger brother of former PNG Union Mission president, the late Geoffrey Pomade. Graduating students were encouraged to be ambassadors for God by living lives of integrity, not only in their next years of studies but for life. Named after pioneer Australian missionary Septimus Carr, who with wife Edith arrived on Papua New Guinea shores in 1908, Carr Memorial Primary has a total enrolment of 1,192 students – the largest Seventh-day Adventist primary school in terms of enrolment in the South Pacific Division. 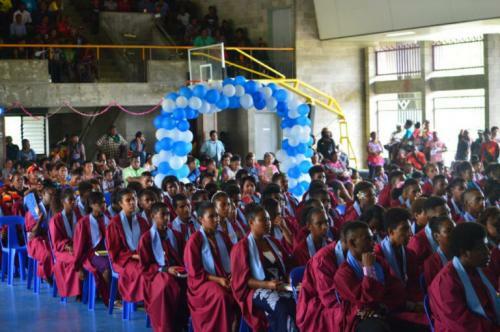 Due to that and the increased turn out over the years, the graduation has since been held at the nearby government-run Port Moresby National High School. In 2016, the South Pacific Division’s Accreditation rated Carr Memorial as a level 7 school. The school administration is working hard towards level 8 ratings to cater for the increased enrolment, which will make it the highest in the country. Despite the challenges throughout the year, under the leadership of Principal Nida Bland, Deputy Laka Batu and the commitment of the 30 teachers and ancillary staff and the school board, the school has continued to grow as evidenced by its graduating students. Educational leaders said that professional development of staff remains a key focus for the administration through in-service with supervisory and curriculum framework reviews. “Apart from teaching and learning, the main activities are the spiritual revival weeks held every term, routine staff and students worship, and the community health awareness programs in the community,” they shared. As the incessant demand for quality Christian education in Port Moresby increases, leaders said Carr Memorial is earmarked to be the one ‘striving to be the best for Christ’ in the community as the model church-run primary school. “Through God’s grace, the school aims for bigger and better things through in 2018,” they said.